The National Transportation Safety Board has stepped up its enforcement of the rules governing proper torque of rail car tank lid bolts. And railroad operators have finally begun to realize the importance of bolt torque after neglecting this issue for decades. As Railway Age reported in 2016, both the federal government and railway industry are trying to reduce the volume and severity of leaks from railcars – known as non-accidental releases, or NARs.. According to the American Association of Railroads, more than 60 percent of NARs involve the tank car’s manway system, which are sealed with a gasket and a collection of bolts. The proper torque of rail tank car lid bolts is typically between 100 and 600 foot pounds, depending on the bolt size and lid configuration. Operators should consult tank car manufacturers to confirm the necessary torque for each tank car lid. Every bolt has a torque specification; the challenge for this application is applying that torque with the proper tool. And while the torque here is relatively low when compared to industrial applications, this job becomes difficult because of the location of the bolts on top of the tank car. This becomes a dangerous application if the bolts are torqued with a traditional, manual “click” style torque wrenches, due to the force that needs to be applied by the person pulling on the wrench. RAD torque has developed a reaction arm tool, allowing an operator to torque these bolts without having to apply any force. 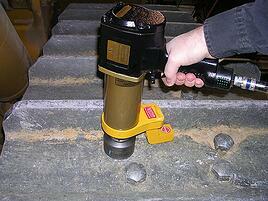 This helps prevents falls from the top of a tank car, while ensuring the proper torque of rail car tank lid bolts. RAD torque tools are available in battery-operated, pneumatic and electric configurations, all of which are suitable for railway applications. And all RAD products sold by Maxpro Corporation are calibrated according to ISO 17025 standards, which is a requirement when using torque tools on tank car lid bolts. Proper torque of rail car tank lid bolts is essential to the safety of the public and your workers and the good of your company. Contact Maxpro today to find out how we can help you complete your next railway application.